Sarah has been a compulsive reader her whole life. At a young age, she found her reading niche in the fantastic genre of Speculative Fiction. She blames her active imagination for the hobbies that threaten to consume her life. She is a freelance writer and editor, a semi-pro nature photographer, world traveler, three-time cancer survivor, and mom to one six-year-old, and one rambunctious toddler. In her ideal world, she’d do nothing but drink lots of tea and read from a never-ending pile of speculative fiction books. Sarah has been running Bookworm Blues, a popular and highly respected speculative fiction book review website for eight years. She ran a weekly column on SF Signal called Special Needs in Strange Worlds, talking about the importance of disabilities in the genre for three years. She is a regular guest on genre podcasts, and has been a panelist at several large literary conventions in her area. 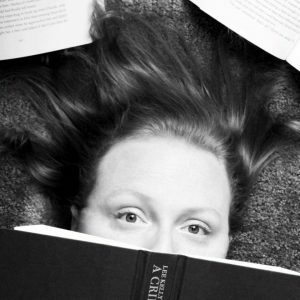 She has been a judge for the Self-Published Fantasy Blog Off, hosted by Mark Lawrence for three years running. Sarah has had a few editorial pieces published, most recently by Jim C. Hines in Indivisible 2. She currently works as a freelance developmental and copy editor and takes a ridiculous amount of pride in the fact that she reads roughly 200 books a year. You can find her annoying people on Twitter as @BookwormBlues, on Facebook, and here, on Bookworm Blues. Sarah (at) bookwormblues (dot) net. No spam, please. 1. I review speculative fiction. This means that while your autobiography, or the book you wrote about the guy who invented ice cream might be fascinating, but it doesn’t fit this site and I won’t review it. 2. I appreciate when people send me queries before they send me their books. Please be aware of the fact that I get so many queries in my email, I cannot reply to all of them. I know this is bad form, but if you send me a query that doesn’t appeal to me, or I don’t have time to read your book or whatever, I’ll probably not reply. Horrible and unprofessional? Yes, but I don’t have a lot of time so that is how I have to work it. 3. I am currently not accepting self-published books. This isn’t because I hate on self-published authors. I go in and out of accepting them so check back frequently. The reason I’m currently not accepting them is because my backlog of traditionally published books is impressive and embarrassing so I need to winnow that pile down a bit before I can accept self-published books. 4. I try very, very hard to get books read and reviewed within two weeks of publication date. However, some authors or PR people have requests for books to be reviewed on a different date. Please tell me when you need your review posted, and I will try very hard to get it done by that time. That being said, also be aware of the fact that I get roughly 20 books in my mail a week, and I have a life, so while I try very hard to be timely, it does occasionally happen that I’m not. I will try hard, but that’s not a guarantee that I won’t be a month off on the review post time. 5. I prefer to read an author’s book before I interview them. 6. All of my reviews are posted on Goodreads, Twitter, and Facebook. If you want me to post on Amazon, you need to request it. 7. I also occasionally have reviews posted on Fantasy Literature. I don’t choose what reviews are posted and I don’t choose when they post, but random reviews of mine are posted over there, so be on the lookout for that. 10. I like to podcast. If you podcast and you’re looking around for a guest to have on (genre related, please) contact me. 11. I don’t mind my reviews being spread around, or quotes being blurbed various places, but I do want to keep track of who put what where. All reviews posted on this website are my property. If you’d like to use them, or quote them, please ask my permission first. 12. In accordance with the new FTC Guidelines for blogging and endorsements, I would like everyone to know that while I do purchase my own books for review on occasion, most books are provided by the authors and/or publishers. I do specify which ones were provided for free. The books that do not say how they were procured are the ones I purchased myself, or got from the library. You shouldn’t be able to tell the difference in my reviews. 13. I have been inundated recently by people who want me to edit their huge novel for free. I do not edit for free, or for cookies, or for a good vibe sent my way from a happy author. Period. It takes a lot of time, and expecting me to dedicate that kind of time to someone for free is actually kind of insulting. If you are interested in me editing your book, contact me. I do, however, enjoy beta reading, and I do not charge for that. 14. My reviews are honest. I try to be constructive in everything I write, but if your book doesn’t work for me, I will say that, and I will say why. You cannot bribe my good reviews with coupons, iPods, or money. And yes, I have been offered all of those things. 15. I also edit books. I will not review any books I edit.